2. So to the monkey business – the work is in the Tate Modern postmortem, I don’t know that Judd would have approved of this particular installation, but that’s beside the point and the Tate owns it now. And monkey business has ensued. 3. Judd’s purpose to his sculptural work (and the whole heart of minimalist sculpture) was to ENGAGE and ARTICULATE a space – very different from the idea of a sculpture to take up space (like the David). Therefore the aim of his work was to change the way in which you the viewer consider and move around space. His work has scored a perfect 10 by having a little girl swarm around the work, and dive in to find a bed in his artwork. 4. Beds – Judd loved them and designed some incredible beds. 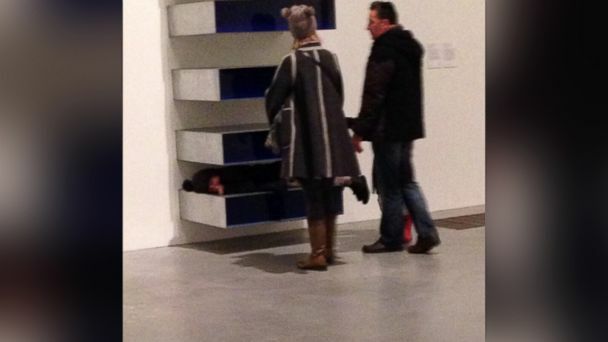 He actually at one point asked why on earth don’t we have beds in galleries to view the artwork – there are many angles to looking at art and lying down should be one of them. So again, the girl is genius and is clearly channeling him. If you go to Marfa now, there is a bed designed by Judd in one of the spaces – blank in the middle of the room, it’s lovely. Do I think that the parents were actually seeking cheap publicity to promote their clothing brand, yes, and maybe even the gallerist who tweeted the expletives about poor parenting. To use the British term, that was very DAFT. And at that I say poo poo, it’s not OK to use other people’s expensive art and your innocent children as a departure for your self promotion. Sorry for the mouthful, can’t help myself when it comes to art;-) HAVE FUN!!!!!! Some time ago, in what now seems like a former life, spent a summer working at the Allan Stone Gallery on the upper east side in NYC. It was my first experience hanging around works of at that cost many millions of dollars. I vividly recall not wanting to touch anything. It was scary as hell. While I was sorting their slides (or something like that), they told me to sit at this desk that was built by Antoni Gaudi (the famous Spanish architect). When I told them I wasn't comfortable using this desk, I recall them kindly telling me, "It's a desk. Please use it as a desk." I had and still have a lot of respect for that statement.